With so much energy, it is hard to believe he was so sick. What a strong, little guy who made huge paw prints on our hearts. Sometimes you have years, sometimes days, sometimes minutes to say goodbye. The worst part is, many times you never know. What happened this week was completely unexpected and we’re still numb having lost Dante, our F1 Bengal. Though it’s been an emotional time saying goodbye to several of our older residents lately, we seem to have been better prepared for those – if there is such a thing? But we weren’t ready to lose our spunky little Dante. He came to live with us in 2014 and immediately took such a special place in our hearts. It had taken a lot to arrange his rescue. He’d been given up, along with another wild hybrid, by a family whose life circumstances changed. 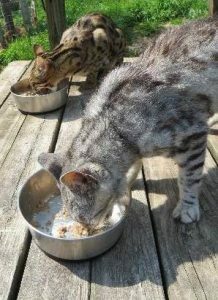 Then, the person who took them in also found these two cats were too much to handle. She looked for alternatives and we agreed to take them both in. We set about finding a suitable group for him to live with. After many introductions, he was very happy living with Bullet and Jewel. Dante settled in and was always zipping around his enclosure, eager to eat and ball of energy. But when his buddy Bullet passed away recently from chronic cancer, we noticed Dante wasn’t acting normally. We thought it might be due to the loss of his friend, but we scheduled a veterinary exam to assure everything was ok with him. Never would we have expected what we found. During his exam, a large mass was detected in his abdominal area. Emergency surgery was performed to remove what appeared to be a very aggressive lymphoma. Sadly, Dante passed away after a long surgical procedure to remove the mass and a section of his intestine. Going in, we thought this would be a routine physical exam. How is it he’s gone now? Like you, we can’t help but question the fairness when we lose our loved ones, too. There’s not a person here who isn’t walking around choking back tears. He may have been a little one, but our love for him was huge. We know we provided the best life Dante could’ve wished for. We know there’s nothing that could’ve prevented the health issues that took him from us so suddenly. Yes, we know all of this in our heads. But, in our hearts, we know only sorrow and grief right now. His future was so bright. We have many cats around us, thankful to be here and for the wonderful lives we’ve given them. We know Dante would want us to dry our tears and carry on. And to treat each and every day with them as the special gift it is. That’s Dante’s legacy to all of us – and we’ll continue to honor him this way, making every day count. 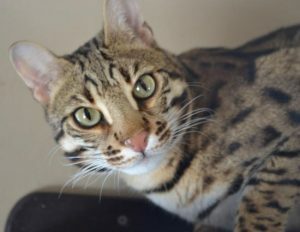 Dante is an F1 Bengal that was privately owned and surrendered by his owner when life circumstances changed and caring for him became too much of a challenge for the family. It’s sad that we hear this story over and over again. Luckily for Dante, we were able to accept him into our program. When he arrived in 2014, it was estimated he was approximately 5 years old. He has a history of chewing cords and material, a problem that a lot of hybrids have. When caring for cats like Dante, caretakers must assure there is nothing dangerous for him to ingest since it can lead to intestinal blockages. We’ve seen this happen with many of the wild cats people try to keep as pets in their home – something they, of course, are never meant to be. Dante is one of the most vocal of the hybrid cats here and is always the first outside to greet his caretakers in the morning. He’s always seeking attention, but physical interaction is not what he wants. He’s adapted well to life in the Hybrid Haven section of our sanctuary, enjoying the freedom to go inside his bungalow to enjoy climbing and napping opportunities there or to explore his outdoor habitat that’s safely roofed. 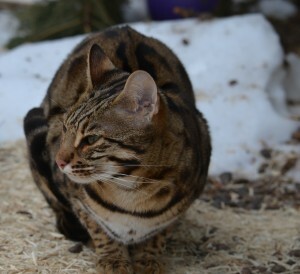 Though we tried introducing him to another Bengal named Kasha, it wasn’t a good match so we’ll try to introduce him to another friend in the spring time. For now, Dante likes having neighbors on both sides that he can interact with and learn from. We’re pleased that we’re able to offer him the opportunity to live among others of his species, thanks to our wonderful sponsors and supporters.